In contrast to static website hosting, dynamic sites that depend on server-side code are best hosted using Azure App Service. When you enable static website hosting on your storage account, you select the name of your default file and optionally provide a path to a custom 404 page. As the feature is enabled, a container named $web is created if it doesn't already exist. The selected default file name is used at the root and any subdirectories when a file name is not provided. If the server returns a 404 and you do not provide an error document path, then a default 404 page is returned to the user. The default public access level for files is Private. Because the files are served through anonymous access requests, this setting is ignored. There's public access to all files, and RBAC permissions are ignored. To make your static website files available over HTTPS, see Using the Azure CDN to access blobs with custom domains over HTTPS. As a part of this process, you need to point your CDN to the web endpoint as opposed to the blob endpoint. You may need to wait a few minutes before your content is visible as the CDN configuration is not immediately executed. When you update your static website, be sure to clear cached content on the CDN edge servers by purging the CDN endpoint. For more information, see Purge an Azure CDN endpoint. 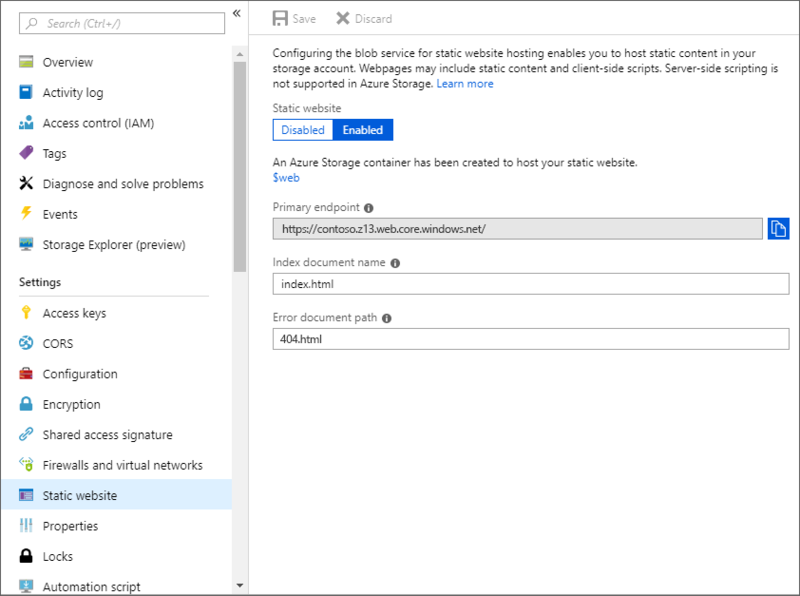 You can configure a custom domain name for your Azure Storage account to make your static website available via a custom domain. 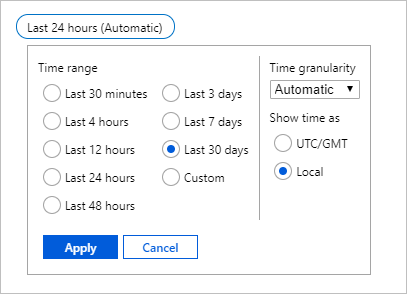 For an in-depth look at hosting your domain on Azure, see Host your domain in Azure DNS. Static website hosting is provided at no additional cost. For more details on prices for Azure Blob Storage, check out the Azure Blob Storage Pricing Page. Next, upload your assets to the $web container via the Azure portal or with the Azure Storage Explorer to upload entire directories. Make sure to include a file that matches the index document name you selected when enabling the feature. Finally, navigate to your web endpoint to test your website. In all cases, make sure you copy files to the $web container. To enable metrics on your static website pages, click on Settings > Monitoring > Metrics. Metrics data are generated by hooking into different metrics APIs. The portal only displays API members used within a given time frame in order to only focus on members that return data. In order to ensure you are able to select the necessary API member, the first step is to expand the time frame. Next, select Blob from the Namespace drop down. Then select the Egress metric. Select Sum from the Aggregation selector. Next, click the Add filter button and choose API name from the Property selector. Finally, check the box next to GetWebContent in the Values selector to populate the metrics report. Once enabled, traffic statistics on files in the $web container are reported in the metrics dashboard. Is the static websites feature available for all storage account types? No, static website hosting is only available in GPv2 standard storage accounts. Are Storage VNET and firewall rules supported on the new web endpoint? Yes, the new web endpoint obeys the VNET and firewall rules configured for the storage account. Is the web endpoint case-sensitive? Yes, the web endpoint is case-sensitive just like the blob endpoint.